Leather was the most popular material for making shoe gear until the late 1800s, when inventor Charles Goodyear accidentally dropped rubber into heated sulfur, creating vulcanized rubber. Prior to his serendipitous discovery, rubber was a relatively useless material because it melted at relatively low temperatures. The newfound resiliency of this material would have numerous applications, including the production of the first athletic shoe. Although alternate names for the new footwear included tennis shoes, trainers, and runners, the term sneaker became the most popular in the US, and its origin can be traced back to an 1887 quote from The Boston Journal of Education:1 “It is only the harassed schoolmaster who can fully appreciate the pertinency of the name boys give to tennis shoes—sneakers.” Apparently, the soft rubber soles allowed schoolchildren to sneak up quietly on unsuspecting teachers. The design of the first sneaker manufactured specifically for running was simple: a thin rubber sole was covered with a canvas upper, providing nominal cushioning and protection. The next generation of running shoes had thicker midsoles with large medial and lateral heel flares designed to improve stability. Unfortunately, the lateral heel flares were quickly proven to increase the potential for injury, as they provided the ground with a longer lever for pronating the rearfoot during heel strike (Figure 1). To make matters worse, many of the early running shoes also had plastic reinforcements built around the heel counters, which also increased the initial velocity of pronation, making them more likely to cause injuries than prevent them. 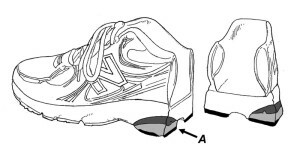 In contrast to the poorly built early models that were designed around a static model of foot function, modern running shoes are made with foam midsoles shaped with negative flares and toe springs that allow the feet to move more naturally (Figure 2). The outsoles are made from synthetic rubber that effectively resist abrasion and improve traction, while the uppers are made from an open mesh material that improves ventilation. 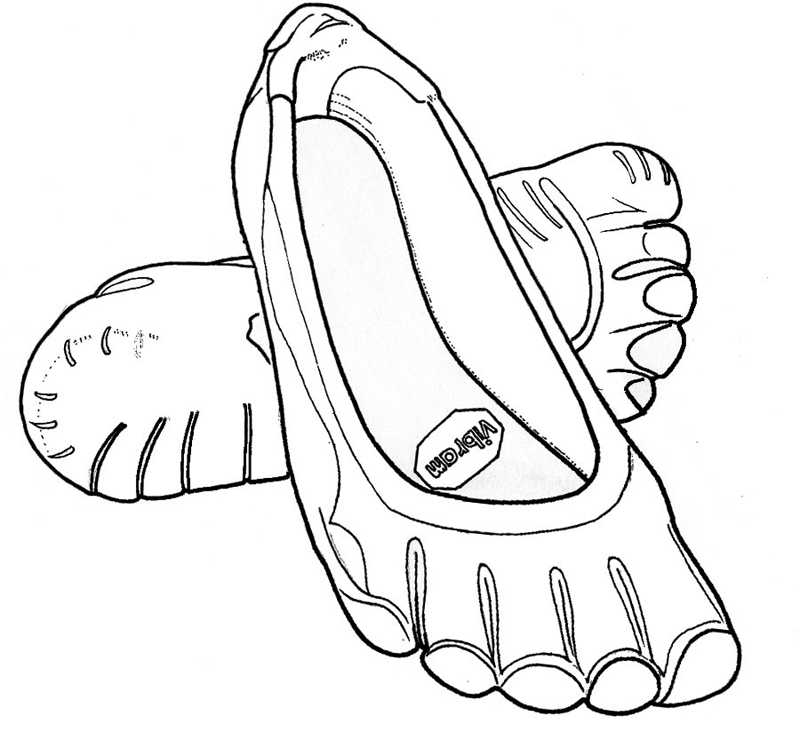 To accommodate different foot shapes, running shoes are manufactured with straight, semicurved, or curved lasts (Figure 3). 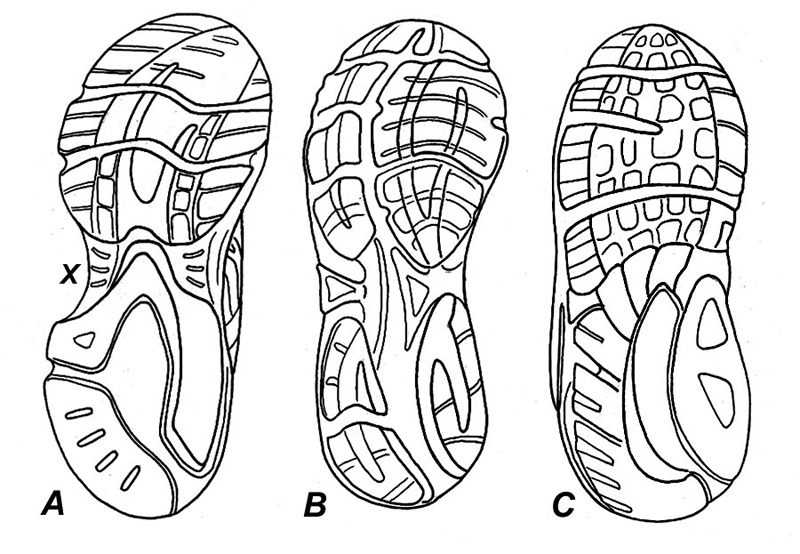 The upper, in addition to providing space for the toes, also possesses an elaborate lacing system that has the ability to modify motion (Figure 4). In their detailed analysis of foot motion and pressure distribution in runners wearing the same type of running shoe tightened with different lacing techniques, Hagen and Hennig2 demonstrate that the high seven-eyelet lacing pattern secured with moderate tension produced significant reductions in peak pressure beneath the heel and outer forefoot, along with reduced loading rates and pronation velocities. The authors claim that, because this technique creates a firm foot-to-shoe coupling that lessens loading rates and pronation velocity, the firm seven-eyelet lacing pattern may play an important role in reducing the risk of running injuries. Although lacing may favorably modify impact forces and the speed of initial pronation, the most functional portion of a running shoe is the midsole, which is made from a variety of foams and gels to enhance shock absorption and durability. 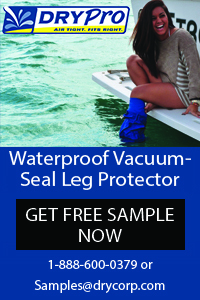 Polyurethane (PU) is the most resilient of these materials. The typical polyurethane midsole can tolerate up to 700 miles of running before it needs to be replaced. Ethylene vinyl acetate (EVA) is another common midsole material. Despite its tendency to deform rapidly with repeated impacts, EVA is a popular material because it is inexpensive to produce and easy to mold. Other materials have recently been incorporated into midsoles, such as Adiprene, which is made from urethane polymers that have been chemically treated to enhance strength and resilience. The new midsole materials are lightweight, durable, and designed to store and return a greater percentage of impact energy than traditional materials. Because the vast majority of runners strike with the lateral heel, running shoe manufacturers incorporate dual-density midsoles in which the outer portion of the midsole is significantly softer than the inner portion. The softer outer material lessens impact forces and decreases the initial velocity of pronation, while the firmer inner material provides protection against excessive pronation (Figure 5). To protect the outer heel from breaking down, the outer sole is reinforced with high-density carbon rubber that effectively resists abrasion. Another important attribute of a midsole is its overall stiffness. In my experience, the stiffness of a running shoe midsole is the most important factor associated with comfort and injury prevention. Midsole stiffness can easily be evaluated by twisting the shoe in several directions while grabbing the heel and forefoot. There is a surprising amount of variation in midsole stiffness, as running shoes will bend with anywhere from 5 to 50 pounds of force (Figure 6). The best running shoes will bend with very little pressure, allowing the feet to move freely in all directions. Unfortunately, manufacturers rarely provide information regarding overall stiffness, but it is important for runners to know the precise degree of running shoe stiffness that is most comfortable for them. High-arched runners tend to be drawn to extremely flexible midsoles while low-arched runners usually prefer a slightly stiffer midsole. Extremely stiff midsoles are almost universally uncomfortable. Figure 5. The dual-density midsole (A). Figure 6. Evaluating midsole stiffness. Besides interfering with balance, an additional problem with excessive midsole cushioning is its weight. Because of the long lever arm between a running shoe and the hip musculature, the muscles are forced to work harder to accelerate and decelerate the added weight. Researchers have shown that increasing shoe weight by 100 g (3.5 oz) increases the metabolic cost of running by 1%.7 The increased exertion associated with accelerating and decelerating a heavy midsole can be extremely fatiguing when worn over the course of a marathon. Figure 7. The heel-toe drop. 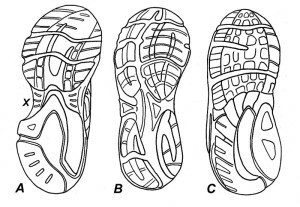 Most manufacturers provide information regarding the thickness of the midsole along its outer margins (A,B), not beneath the center of the forefoot and rearfoot (C,D). Measurements of midsole thickness taken directly beneath the foot are much different. In the above New Balance 860, which was cut into pieces, the manufacturer listed the thicknesses of the rearfoot and forefoot as 38 mm and 26 mm, respectively. In reality, the measured thicknesses beneath the heel and forefoot are 22 mm and 11 mm, respectively, providing a heel-toe drop of 11 mm. Given that excessive midsole cushioning can impair balance and reduce efficiency, it might seem that the best midsole would be no midsole at all. 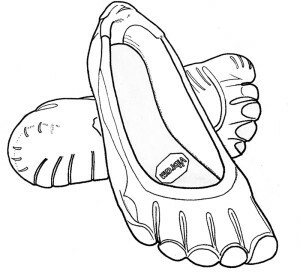 Although advocates of barefoot running often suggested this, the complete removal of a midsole may result in chronic injury because the heel and forefoot fat pads will be vulnerable to trauma. Researchers from the Netherlands have reported that barefoot running results in a 60% deformation of the calcaneal fat pad, while running with running shoes with conventional midsoles results in only a 35% deformation of the fat pad.8 When repeated tens of thousands of times over a running career, the 60% deformation has the potential to permanently damage the walls of the protective fat pads, resulting in chronic heel and forefoot pain. One of the more intriguing aspects of this study was that the researchers also evaluated efficiency as runners ran on specially designed treadmills fitted with 10 and 20 mm of midsole material attached directly to the treadmill belt. Interestingly, the treadmill fitted with 10-mm midsole material produced the same improvement in efficiency as the treadmill fitted with 20-mm midsole material. Apparently, just as flexible running tracks providing 7 mm of deflection allow for the fastest running times, 10 mm of midsole cushioning provides the ideal amount of energy return with less weight and only a minimal reduction in sensory perception. To provide adequate cushioning without reducing efficiency by adding unnecessary weight, most running shoes are made with a little more than 10 mm of midsole material under the forefoot. 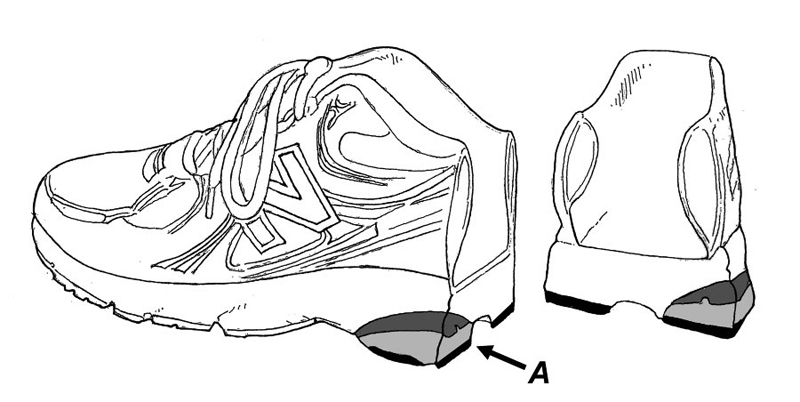 To protect the heel pad from trauma, the midsole beneath the rearfoot is usually 6 to 12 mm thicker (Figure 7). Referred to as the heel-toe drop or heel-toe differential, the difference in midsole thickness between the rearfoot and midfoot is an important factor for both comfort and injury prevention. The majority of recreational runners who are heel strikers typically prefer about 10 to 12 mm of heel-toe drop. More experienced heel-strike runners favor the reduced weight associated with a 6-mm heel-toe differential. Conversely, fast runners who strike the ground with their midfoot do not need extra cushioning placed beneath the heel and prefer the reduced weight associated with a zero-drop midsole. Because runners with different arch heights are prone to different types of injuries, running shoe manufacturers have developed motion control, stability, and cushion running shoes for low, neutral, and high-arched runners, respectively (Figure 8). To control excessive pronation in low-arched individuals, motion control running shoes possess dual-density midsoles with additional midsole material beneath the center of the arch. Motion control running shoes are also made with straight lasts to match the shape of the typical pronated foot. On the other side of the spectrum, cushion running shoes are made for runners with high arches and are manufactured with a curve-lasted shape designed to fit the typical high-arched foot. The midsoles in cushion running shoes are significantly softer than in motion control shoes to improve shock absorption. To fit runners with neutral feet, stability running shoes are made with semicurved lasts and a moderate amount of midsole cushioning. For the past 30 years, the prescription of motion control, stability, and cushion running shoes for runners with low, neutral, and high arches was believed to reduce injury rates and increase comfort. However, some recent research disputes this theory. In one of the largest studies done to date,10 Knapik et al divided 1400 male and female Marine Corps recruits into two groups: an experimental group in which running shoe recommendation was based on arch height, and a control group in which recruits wore neutral stability running shoes regardless of arch height. After the recruits completed an intensive 12-week training regimen, there was no difference in injury rates between the two groups; the authors concluded that prescribing running shoes according to arch height was not necessary. In another study evaluating the value of prescribing running shoes according to arch height, Ryan et al11 categorized 81 female runners as supinators, neutral, or pronators, and then randomly assigned them to wear neutral (a categorization that corresponds to the description of cushion shoes above), stability, or motion control running shoes. Again, the authors concluded there was no correlation between foot type, running shoe use, and the frequency of reported pain. Interestingly, the individuals classified with neutral and pronated foot types reported greater levels of pain when wearing the motion control running shoes. This is consistent with the hypo­thesis that excessive midsole thickness may dampen sensory input, amplifying the potential for injury. Figure 8. Bottom view of the three basic types of running shoes. Cushion running shoes (A) are made for individuals with high arches. They are slightly curved to match the shape of the typical high-arched foot and possess flexible midsoles with significantly less bulk in the midfoot region (X). The reduced midsole material in the midfoot gives the shoe an hourglass appearance when viewed from below. Stability sneakers (B) are made for individuals with neutral foot types. They are straighter and have slightly more midsole material reinforced beneath the arch. In contrast, motion control sneakers (C) are straight and are strongly reinforced throughout the midfoot with extra-thick midsole material. Because of the additional midsole material, motion control sneakers are extremely stiff. Supporting the belief that running shoe prescription should continue to be based on arch height, several high-quality laboratory studies have shown that the different types of running shoes actually do what they are supposed to do. Researchers measured arch height and evaluated impact forces, tibial accelerations, and the range and speed of pronation after high- and low-arched runners were randomly assigned to wear cushioned and motion control running shoes.12 The detailed analysis confirmed that motion control running shoes do, in fact, control rearfoot motion better than cushioned running shoes, and cushioned running shoes attenuate shock better than motion control running shoes. In another study evaluating the effect of motion control versus neutral shoes on overpronators, Cheung and Ng13 used electrical devices to measure muscle activity as participants ran 10 km. The authors noted that, when wearing motion control shoes, runners who pronated excessively reported reduced fatigue in the tibialis anterior and peroneus longus muscles. In a separate study of excessive supinators, Wegener et al14 evaluated plantar pressure distributions in high-arched individuals who wore either cushioned running shoes or a control shoe. The authors confirmed the cushioned running shoes distributed pressure more effectively and were perceived as being more comfortable than the control running shoes. The results of the last two studies suggest that the practice of prescribing running shoes based on arch height has some merit, particularly for people on the far ends of the arch height spectrum. When one looks at all of the research evaluating running shoe prescription and injury, it becomes clear that the most important factors to consider when selecting a running shoe are that it fits the foot perfectly (in terms of width, length, and shape) and that the midsole is comfortable. Midsole selection should also take into consideration running style: heel strikers often need additional cushioning beneath the rearfoot, while midfoot strikers typically prefer zero-drop midsoles. In almost all situations, even extremely flat-footed runners should think twice about wearing heavy motion control running shoes because they may dampen sensory input from the foot and their extreme stiffness may result in ankle or knee injuries or both. Runners should experiment with a range of running shoes until they find just the right thickness, stiffness, and downward slope. For a brief period, Reebok manufactured a running shoe with an air pump in the tongue that inflated the sides of the heel counter. Because it took too long to inflate with each run, the running shoe was modified so it could be filled with a replaceable gas chamber. Possibly because of the expense of replacing the chamber or the hassles of filling the heel counter, the customizable heel counter was short-lived. Nonetheless, a tight-fitting heel counter continues to be one of the most important and underrated aspects of finding the right running shoe. Modern running shoes are made with lined foam heel collars to stabilize and protect the heel. Because each running shoe has a slightly different heel collar, each runner will have to try on a few different models to find the specific running shoe that best fits his or her heel. Another problem with minimalist shoe wear is that runners who try to make the transition too quickly risk injury. In a recent study published in Medicine & Science in Sports & Exercise, researchers from Brigham Young University in Provo, UT, noted that 10 out of 19 runners transitioning into minimalist shoes over a 10-week period became injured, compared with only one out of 17 runners in the control group who ran in conventional running shoes for the entire 10-week period.19 In my experience, runners with narrow forefeet are much more likely to be injured while wearing minimalist shoes. This is especially true for runners with low arches, tight calves, or both. The final factor to consider is that “barefoot running” with minimalist shoes produces a running style that is very different from true barefoot running. As pointed out by Altman and Davis,20 running while actually barefoot causes the runner to strike the ground with the midfoot nearly horizontal. In contrast, runners wearing minimalist shoes often strike the ground with their ankles pointing down more, which increases activity in the soleus muscle and greatly increases bending strains in the tibia, potentially increasing the likelihood of a tibial stress fracture).20 Apparently, to get the benefits of barefoot running, a runner really has to be barefoot. Some newer minimalist running shoe models feature thicker midsoles; in my observation, this is because manufacturers have realized that runners want and need cushioning, which calls the original premise for the design of such footwear into question. Despite its questionable value for reducing injury risk and improving efficiency, minimalist running is an effective way to strengthen the muscles of the arch. Running short distances with minimalist shoes is also an excellent gait-retraining tool because these shoes force runners to shorten their stride and increase cadence. 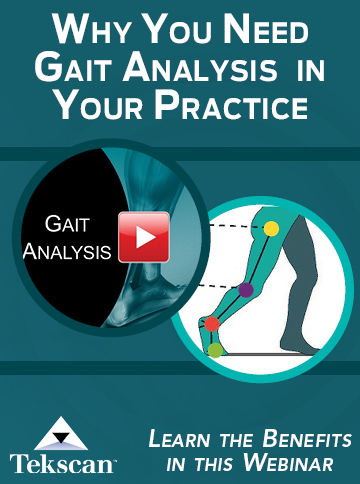 Although almost always associated with slightly reduced running speed, these simple gait alterations markedly lessen impact forces,21 making them useful for treating a wide range of running-related injuries. When worn recreationally while walking or slow jogging, minimalist shoes favorably stimulate muscles of the arch without overloading them, often resulting in an increased arch height when worn regularly for an extended period.22, 23 After an appropriate break-in period, runners should consider doing speed workouts on grass or soft dirt as a way to increase tone in the arch muscles. In spite of their questionable value for improving performance, minimalist shoes are an excellent addition to a training routine. While I wouldn’t recommend them for long-distance training, the improved strength gains associated with recreational use makes minimalist shoes well worth the initial investment. Tom Michaud, DC, has maintained a private practice in Newton, MA, for more than 30 years and specializes in the treatment and prevention of running injuries. This article has been excerpted from his new text, Injury Free Running: How to Build Strength, Improve Form, and Treat/Prevent Injuries, which is available at humanlocomotion.org. 1. Crisp Sayings. The New York Times. September 2, 1887. 2. Hagen M, Hennig EM. Effects of different shoe-lacing patterns on the biomechanics of running shoes. J Sports Sci 2008;27(3):1-9. 3. Robbins S, Gouw GJ, McClaran J. Shoe sole thickness and hardness influence balance in older men. J Am Geriatr Soc 1992;40(11):1089-1094. 4. Robbins SE, Gouw GJ, Hanna AM. 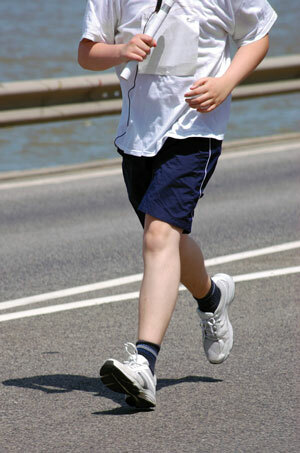 Running-related injury prevention through innate impact-moderating behavior. Med Sci Sports Exerc 1989;21(2):130-139. 5. Robbins S, Hanna A. Running-related injury prevention through barefoot adaptations. Med Sci Sports Exerc 1987;19(2):148-156. 6. Robbins S, Waked E. Balance and vertical impact in sport: role of shoe sole materials. Arch Phys Med Rehab 1997;78(5):463-467. 7. Jones BH, Knapik JJ, Daniels WL, Toner MM. The energy cost of women walking and running in shoes and boots. Ergonomics 1986;29(3):439-443. 8. De Clercq D, Aerts P, Kunnen M. The mechanical behavior characteristics of the human heel pad during foot strike in running: an in vivo cineradiographic study. J Biomech 1994;27(10):1213-1222. 9. Tung K, Franz J, Kram R. A test of the metabolic cost of cushioning hypothesis in barefoot and shod running. Presented at the 36th Annual Meeting of the American Society of Biomechanics, Gainesville, FL, August 2012. 10. Knapik JJ, Trone DW, Swedler DI, et al. Injury reduction effectiveness of assigning running shoes based on plantar shaped in Marine Corps basic training. Am J Sports Med 2010;38(9):1759-1767. 11. Ryan MB, Valiant GA, McDonald K, Taunton JE. The effect of three different levels of footwear stability on pain outcomes in women runners: a randomized control trial. Br J Sports Med 2011;45(9):715-721. 13. Cheung RT, Ng GY. Motion control shoe delays fatigue of shank muscles in runners with overpronating feet. Am J Sports Med 2010;38(3):486-491. 14. Wegener C, Burns J, Penkala S. Effect of neutral-cushioned running shoes on plantar pressure loading and comfort in athletes with cavus feet: a crossover randomized controlled trial. Am J Sports Med 2008;36(11):2139-2146. 15. Jørgensen U. Body load in heel-strike running: the effect of a firm heel counter. Am J Sports Med 1990;18(2):177-181. 16. Lieberman DE, Venkadesan M, Werbel WA, et al. Foot strike patterns and collision forces in habitually barefoot versus shod runners. Nature 2010;463(7280):531-535. 17. McCarthy C, Porcari, JP, Kernozek T, et al. Like barefoot, only better. American Council on Exercise website. Accessed February 24, 2014. 18. Goss D, Lewek M, Yu B, Gross M. Accuracy of self-reported foot strike patterns and loading rates associated with traditional and minimalist running shoes. 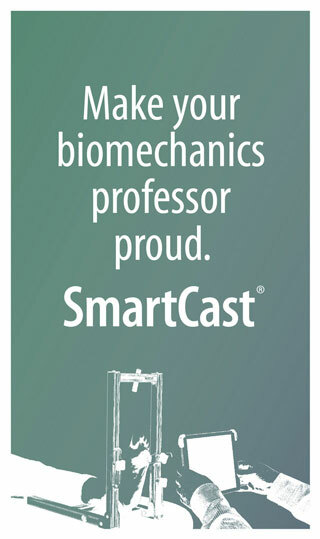 Presented at American Society of Biomechanics Annual Meeting, Gainesville, FL, August 2012. 19. Ridge ST, Johnson AW, Mitchell UH, et al. Foot bone marrow edema after a 10-wk transition to minimalist running shoes. Med Sci Sports Exerc 2013;45(7):1363-1368. 20. Altman A, Davis D. Comparison of tibial strains and strain rates and barefoot and shod running. Presented at the 36th Annual Meeting of the American Society of Biomechanics, Gainesville, FL, August 2012. 21. Heiderscheit BC, Chumanov ES, Michalski MP, et al. Effects of step rate manipulation on joint mechanics during running. Med Sci Sports Exerc 2011;43(2):296-302. 22. Rao UB, Joseph B. The influence of footwear on the prevalence of flat foot. A survey of 2300 children. J Bone Joint Surg Br 1992;74(4):525-527. 23. Robbins SE, Hanna AM. Running-related injury prevention through barefoot adaptations. Med Sci Sports Exerc 1987;19(2):148-156. May 10, 2012 Active Stance: Minimalist footwear: A risky switch for runners?